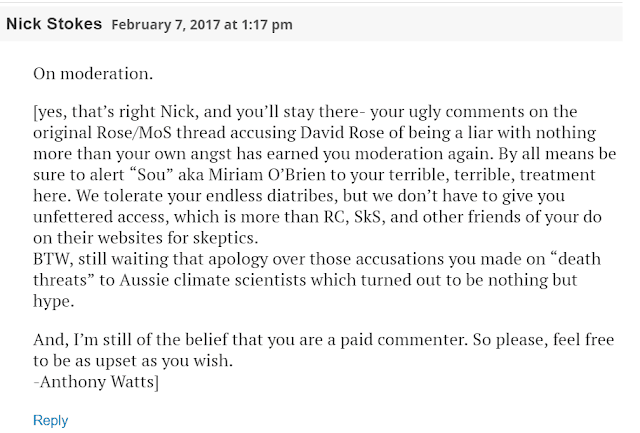 Anthony Watts has published another defamatory article on his blog (archived here). I use the term without it being proven in the courts, but if one of the retired scientists mentioned wanted to take him and Tim Ball to court, he'd surely be able to make a case to be heard. Tim Ball started his false claims in the very first sentence. Before going into the despicable actions of Tim Ball and his publisher Anthony Watts, let me remind you about the NOAA work that they don't understand, but dislike so much they'll risk being sued (yet again, in the case of Tim Ball). 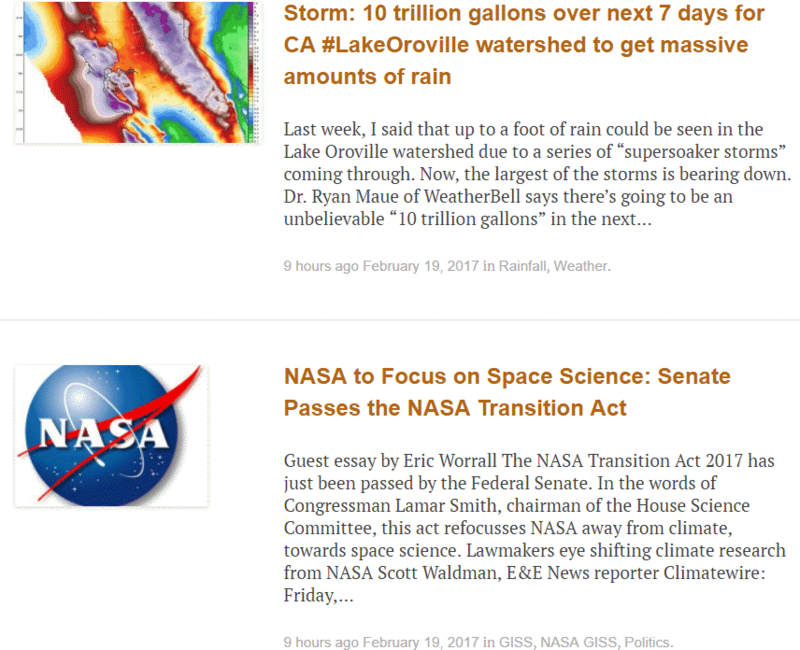 After all the articles at WUWT where they clearly wanted to stop climate research at NOAA, I was struck by the contradiction in the juxtaposition of the two most recent articles (here and here). In one, Anthony Watts' rabble were calling for NASA to stop all climate research. The more recent article was about the massive storms that have been and will be affecting California. David Rose took a short vacation after writing his second article full of false allegations about the NOAA paper published a couple of years ago. Now he's published a third monstrosity. He's digging himself into a deeper hole, aiming to totally sever any slim connection he might have had with science. @ret_ward I already used this info last week. Let me explain. A news story, in general, is meant to contain something new. Since record highs caused last year by an ‘el Nino’ sea-warming event in the Pacific, HadCRUT 4 has fallen by more than half a degree Celsius, and its value for the world average temperature in January 2017 was about the same as January 1998. Anthony Watts, who is known (by those who've heard of him) for promoting lies and disinformation, explained why he didn't like a press release (archived here). The article was about a talk at the AAAS annual meeting held in Boston last week. The talk was by Dominique Brossard from University of Wisconsin, Madison. She was one of three speakers on a panel discussing: "Fake News and Social Media: Impacts on Science Communication and Education". The other speakers were Julie Coiro, University of Rhode Island and Dan Kahan, Yale Law School. The panel was moderated by Seth Borenstein of Associated Press, who is also listed as organiser. Going cool on cool futures or one last, desperate effort? If you don't know what the Lord Monckton Foundation is, it's based in Melbourne Australia. A chap by the name of Chris Dawson is the CEO. An article on the Lord Monckton Foundation website said the fund was set up by "friends" of the foundation, including some board members. Not that the foundation seems willing to admit who is on its board. 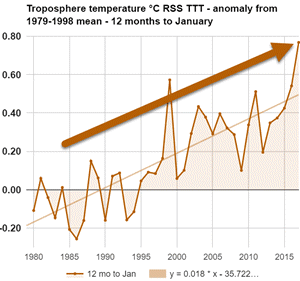 According to GISS NASA, the average global surface temperature anomaly for January was 0.92 °C, which is 0.21 °C lower than the hottest January in 2016 and the third hottest January in the record (after 2016 and 2007). Climate alarmism is a gigantic fraud: it only survives by suppressing dissent and by spending tens of billions of dollars of public money every year on pseudo-scientific propaganda. 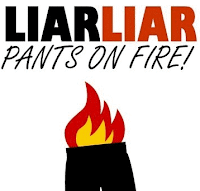 Leo's the chap who is suing umpteen zillion organisations under RICO, for the crime of promoting mainstream science and urging action to protect humanity from dangerous global warming. Here's a link to the Civil Docket containing the wacky conspiracies floating around in Leo's brain. As an example of his delusion, he alleges of the defendants that "Notably, many of the Defendants' websites are intended for audiences with a large percentage of mentally underdeveloped and emotionally unstable persons." and he thinks that urging companies to stop donating to disinformers is a crime (note the emotive language): "Defendants ran a perfectly orchestrated public campaign, that falsely accused ALEC of"climate change denial", threatened its corporate members and donors, and caused many of them to leave or to stop donating to the organization". One day I'll write more about this. The case hasn't got very far yet. Silicon Valley insiders are smart and successful people. By “Silicon Valley insiders,” I mean the founders, owners, venture capitalists, executives, and software professionals of the so-called tech companies located not only in the Silicon Valley, but elsewhere in the U.S. I think he means everyone but the cleaning staff and front desk personnel, who work at tech companies anywhere in the USA. I've had a post in train for a week now, after last week's ridiculously wrong article from David Rose in the Mail on Sunday. He based it on another ridiculous article, that one from John Bates on Judith Curry's climate disinformation blog. David Rose has followed it up with another ridiculously wrong article, which says nothing new and in which he's just trying to justify all the mistakes and lies in his first article. John Bates is a meteorologist turned computer data person whose nose was out of joint because he didn't always get his way when he used to work at NOAA. It was a sour grapes whine from someone who wanted attention. That's all. However his attention-seeking moan had major repercussions through the deniosphere. Earlier this week, in an embarrassing childish display, some of Australia's elected representatives pushed to increase carbon emissions more quickly than we already are. This wasn't juvenile backbenchers behaving in an unseemly fashion. This was our Federal Treasurer, Scott Morrison, and the Minister for Agriculture and Water Resources, Barnaby Joyce. In the video below, Scott Morrison responds to the Dorothy Dixer (planted question) from his backbench colleague, Andrew Hastie, the Member for Canning in Western Australia. Morrison was keen to play the fool in Parliament. He embarrassed Australia in the eyes of the world by portraying everyone who accepts science as idiots or worse. Did you know that Judith Curry recently appeared on an internet alternative television show, with a chap called Richie Allen. Now I've not heard of Richie Allen before, but I have heard of his colleague, David Icke. Richie works for or with David Icke. I'm serious. I'm not kidding. It's all over WUWT - right here. Judith did a Tim Ball and Christopher Monckton. Nah - I think she surpassed even those two this time. It's called Rock Bottom. While you're waiting for more in-depth articles, here's something you don't see every day at WUWT. Anthony Watts has put Nick Stokes on moderation (again). There has been so much happening this week, particularly in the USA, but elsewhere as well. The reason for the apology is because, although I have some articles in the pipeline partly written, I won't have time to finish them for another day or two. 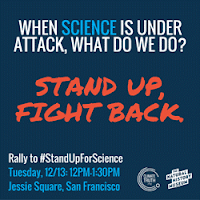 The latest developments from Lamar Smith and his Committee on Science, Space, and Technology and its attempts to intimidate scientists and shut down climate research. 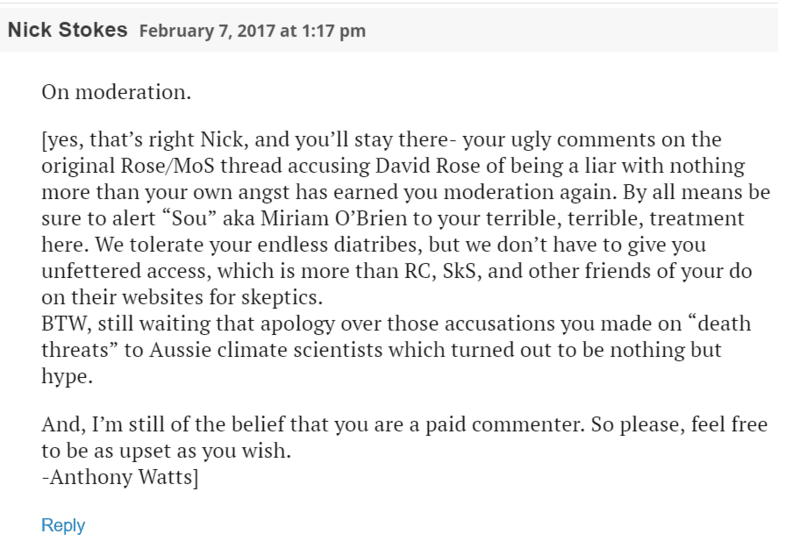 Any insight into why a scientist called John J. Bates would resign from NOAA only to join the climate conspiracy nutters at Judith Curry's place, and then tell big fat lies to a tabloid science-denying writer, David Rose, from a smutty UK rag, the Mail on Sunday. Why he would suddenly turn on his colleagues who supported him when he needed it, and make up stuff to try to discredit them and their work. Why he would ruin any chance of developing trusting relationships with other professionals and businesses he wants to work with in his new career. 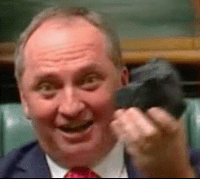 Whether the Australian government will be able to get anyone to buy the coal they want to burn, in their effort to bring on global warming. How much cooler this year will be than last year, given the incredible temperatures in the Arctic and elsewhere. Whether Donald Trump will succeed in his attempt to shut down the judicial arm of the US government and install Steve Bannon as the USA's tyrannical dictator. Whether Donald Trump's war ambitions will involve China, Australia, the UK, the Middle East, Germany, Europe, or the world as a whole. I will be writing more about some of the above, and more, over the next few days, but won't be able to get back to writing for at least another 24 hours. So again - if you can help out, please do so in the comments. If you've got a lot to say and would like to post an article here - let me know. 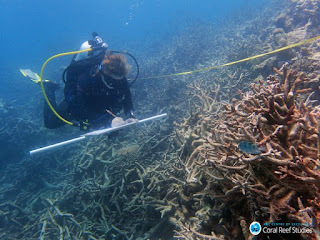 Another case in point today, when a dud ex-engineer (so he says) called Bob Fernley-Jones (Mechanical engineer retired, Melbourne Australia) made up a whole bunch of stuff about coral reefs (archived here). 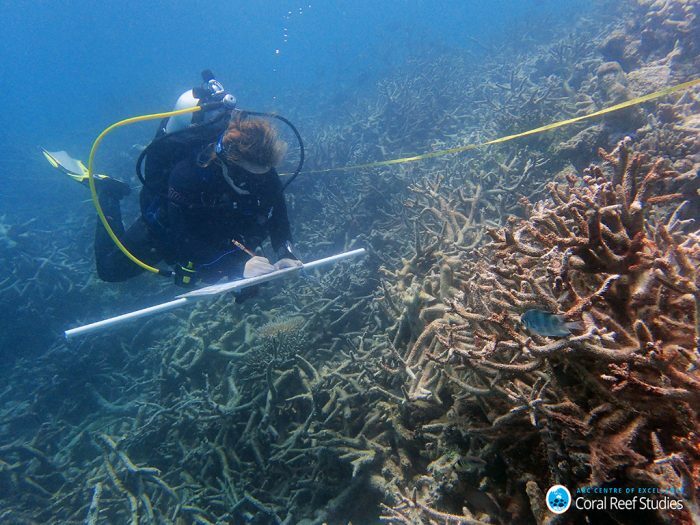 I'd say it was so that he could try to portray himself as being cleverer than climate scientists and coral reef experts. Instead he's a Dunning Kruger case, and a whiner. disinformers are fairly confident that their readers won't bother to do any fact-checking, again with good cause. Bob is sloppy and careless, with missing links and missing diagrams. Actually, it's Anthony Watts who was sloppy in this case (he also got Bob's name wrong). 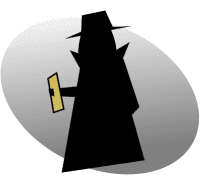 Bob complained in the comments about some of the missing links and diagrams. Bob is a messy thinker, with a summary at the end that is meaningless, incomprehensible nonsense. 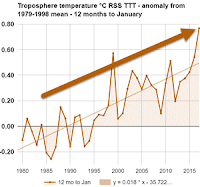 Climate disinformer Eric Worrall took a short quiz at the New York Times (on WUWT archived here). The quiz was a few simple questions about what decisions Donald Trump should take in regard to oil, gas and protecting the planet Earth and the people who live on it. 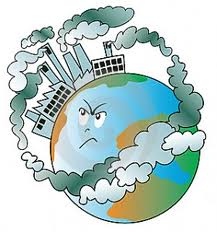 You did a very bad job protecting the environment and may have made many of the worst effects of climate change more likely. It could hardly have been worse. On the upside for President Trump, Republicans in Congress and many of the people who voted for him will support most of your decisions. We guess it’s true what they say about dark clouds (something about silver linings?). What does he expect? That anyone but his fellow planet wreckers would thank him for more floods, more drought, more heat waves, poorer crops, more wildfires, more skin cancer and faster global warming?